Some 33% of SMBs surveyed by security firm ESET don't get training for security. The stakes are high for SMBs because the impact from a security breach can be far more detrimental to the survival of a smaller company than a larger one. "A large enterprise has a number of backstops and usually has a response ready when it happens. But a small organization … the initial infection can probably lead to something more serious and greater," says Stephen Cobb, ESET senior security researcher, noting that a security breach potentially could put an SMB out of business. Cobb says he was surprised that 49% of the roughly 600 US respondents of the ESET Cybersecurity Training in the Workplace survey noted they would be willing to take a cybersecurity training course at their workplace, even if it was optional. He added that in the past it would like "pulling teeth" to get employees to take cybersecurity training, but now employees want to not only learn how to secure their work-related IT, but also their home devices and email. "SMBs are a sweet spot for attackers. While large companies have more to steal, they are better defended. While consumers are less well-defended, they have less to steal. This puts SMB in the bullseye," says Kevin Haley, director of Symantec Security Response. 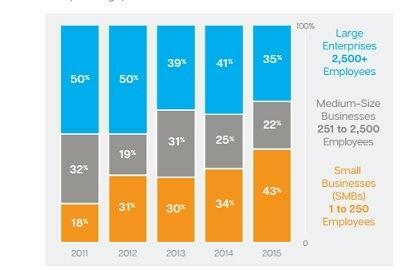 But he also noted that the overall risk for SMBs is usually lower than large companies because there are so many more SMB companies than large ones to target. Most security awareness programs today are fairly rudimentary. "The way security training is currently done at companies is crappy. They show you a 20-minute video and test you afterwards. If you were being trained in martial arts or boxing, do you think watching a 20-minute video will prepare you to immediately step into the ring? That is what we are asking employees to do with the way cybersecurity training is handled," Hadnagy says. 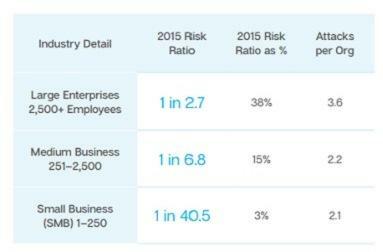 Despite these figures, SMBs clearly are not yet at the point of jumping on the bandwagon to get their employees cybersecurity training. According to an NSBA spokesperson, the lack of training is likely due to the cost and logistics involved. It's also unclear whether SMB owners would expect their cybersecurity to vastly improve if their employees received training, the spokesperson says. In addition to addressing the knowledge gaps SMB employees said they were lacking in the ESET survey, Symantec's Haley also advises training on best practices for cloud computing and password management.